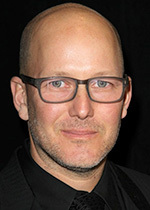 Bill Morrison A’89 is an artist and independent filmmaker who is based in the East Village neighborhood of New York City. He is a member of Ridge Theater in New York and the founder of Hypnotic Pictures. He is married to Laurie Olinder, who also studied art at The Cooper Union, and with whom he collaborates on Ridge Theater productions. While a student at The Cooper Union, Bill most enjoyed the courses in painting, animation, and film. He studied with Robert Breer, Robert Slutzky, Susan Gussow, Robert Storr and Irving Petlin. He received a fellowship to study abroad in Amsterdam for one semester. After Cooper, Bill began working for Ridge Theater where he continues to work. His specialty is creating the film portion of the sets. Photos of the sets can be seen here, Ridge Theater. Through the theater, he became familiar with musicians working in theater, including members of the Bang on a Can collective. Bill also worked at Village Vanguard where he became friends with Bill Frisell and Dave Douglas who became future collaborators. Many of Bill’s works combine rare archival film material set to contemporary music. His break out work was “Decasia,” (2001) which is a 67 minute film edited to a symphony composed by Michael Gordon. The piece was screened at the Sundance Film Festival in 2002, and it was selected for the US Library of Congress’ National Film Registry in 2013. Bill has produced around 50 works that combine film and music. Bill Morrison is a Guggenheim fellow and has received the Alpert Award for the Arts, an NEA Creativity Grant, Creative Capital, and a fellowship from the Foundation for Contemporary Arts. His theatrical projection design has been recognized with two Bessie awards and an Obie Award. Bill was awarded The Cooper Union President’s Citation Award in 2016 and is a member of The Cooper Union Hall of Fame. This entry was tagged Bill Morrison, Decasia, Film Director, President's Citation, Ridge Theater, William Morrison. Bookmark the permalink.